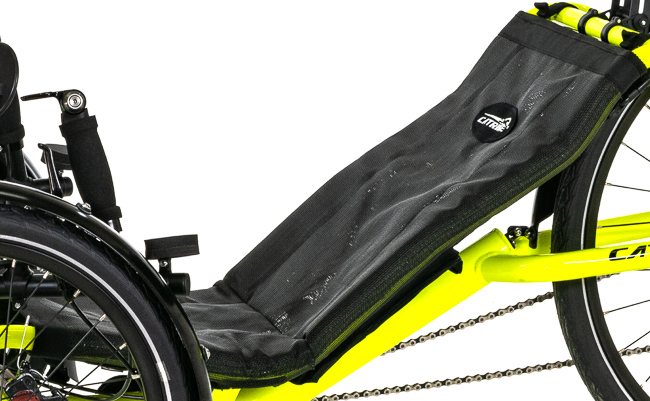 One of the thing that makes Catrike unique is that their seat is an integrated part of the trike's frame. This arrangement makes the trike very stiff, adding to the Catrike's race-car-like handling. The seat is a mesh that wraps around the frame. Comfort of the seat has always been somewhat adjustable by changing the tension of the seat's straps. The last version of the Catrike seat we saw was the Limited Edition version included with the Catrike Muscle editions. Well, the new Catrike seat is much more than just a stripe on the mesh! The new seat fits all Catrike models, with a slightly different version available for the 700. 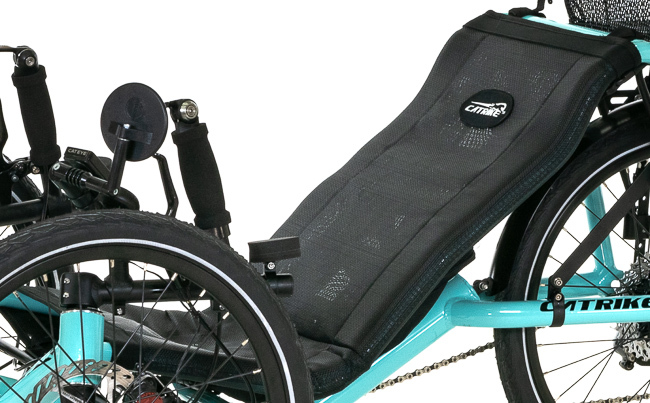 The new design features a stronger and more breathable mesh for the back, and built in padding to go around the seat frame making it extremely comfortable. 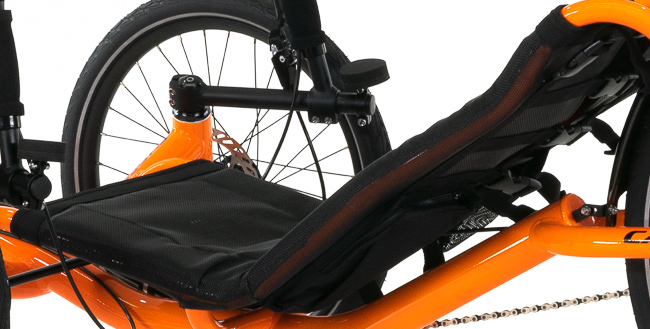 The main attraction here is the new cargo capabilities built into the newest Catrike seat mesh. As noted in our Catrike review, the original seat already had some straps and pockets of a sort. This time they've gone way further with three good-sized pockets and an even better pump holder. On the bottom right of the seat there is a new water-proof cell phone pocket, on the left side two bigger cargo pockets, and on the upper right a pocket for a pump. Check out the pictures below and you'll see just how cool this new seat is!